Germany is phasing out its nuclear plants in favor of wind and solar energy backed-up by coal power. 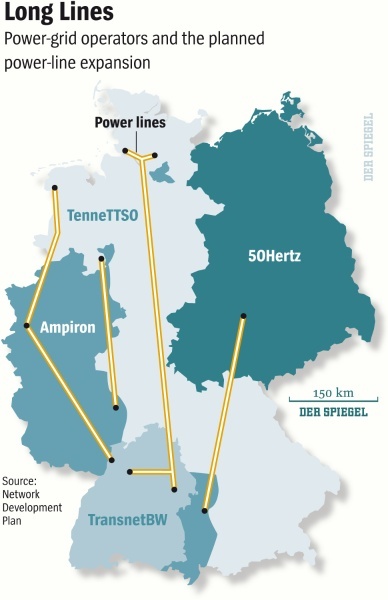 The government’s transition to these intermittent green energy technologies is causing havoc with its electric grid and that of its neighbors–countries that are now building switches to turn off their connection with Germany at their borders. The intermittent power is causing destabilization of the electric grids causing potential blackouts, weakening voltage and causing damage to industrial equipment. The instability of the electric grid is just one of many issues that the German government is facing regarding its move to intermittent renewable technologies. As we have previously reported, residential electricity prices in Germany are some of the highest in Europe and are increasing dramatically (currently Germans pay 34 cents a kilowatt hour compared to an average of 12 cents in the United States). This year German electricity rates are about to increase by over 10 percent due mainly to a surcharge for using more renewable energy and a further 30 to 50 percent price increase is expected in the next ten years. These changes in the electricity generation market have caused about 800,000 German households to no longer be able to afford their energy bills. 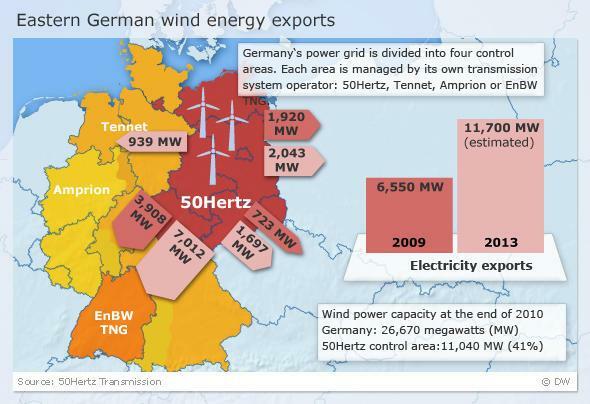 More than one third of Germany’s wind turbines are located in the eastern part of the nation where this large concentration of generating capacity regularly overloads the region’s electricity grid, threatening blackouts. The situation tends to be particularly critical on public holidays when residents and companies consume significantly less electricity than usual with the wind blowing regardless of the demand and supplying electricity that isn’t needed. In some extreme cases, the region produces three to four times the total amount of electricity actually being consumed, placing a strain on the eastern German electric grid. System engineers have to intervene every other day to maintain network stability. 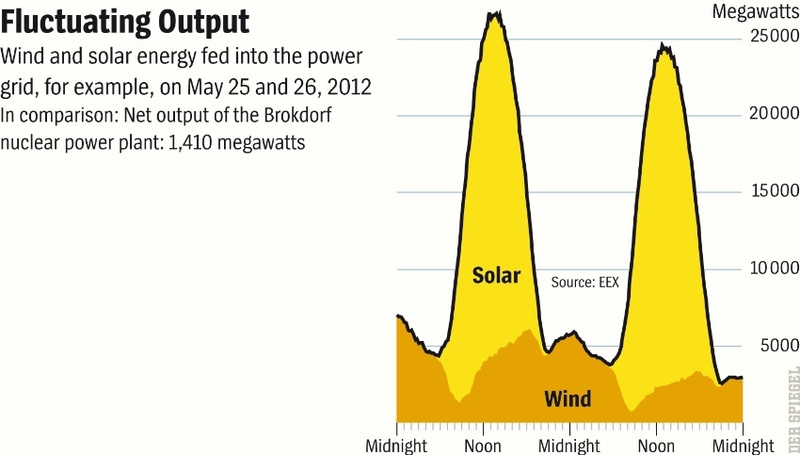 To illustrate the problem that renewable energy instability can cause, here is an example. When the voltage from German’s electric grid weakened for just a millisecond at 3 am, the machines at Hydro Aluminum in Hamburg ground to a halt, production stopped, and the aluminum belts snagged, hitting machines and destroying a piece of the mill with damages amounting to $12,300 to the equipment. The voltage weakened two more times in the next three weeks, causing the company to purchase its own emergency system using batteries, costing $185,000. The German Cabinet backed a plan to build three “power autobahns” stretching north to south to move growing supplies of renewable energy across the country. The plan involves laying about 1,740 miles of new transmission lines and upgrading 1,800 miles of existing cables by 2022, bringing wind power generated in the north to consumers in the south. This plan is a scaled down version of the recommendation made by Germany’s four main grid operators, who indicated that the country’s energy overhaul required about 2,400 miles of new cables and a fourth power-line corridor,[iii] costing $25 billion. [iv] The government also wants to cut the time it takes to develop power lines from 10 to 4 years, and most recently, there have been calls to nationalize the electrical grid. In the meantime, Germany’s neighbors, Poland and the Czech Republic, are taking action on Germany’s use of their power grid that Germany undertook without asking permission and without paying for its use. These countries are building a huge switch-off at their borders to block the import of green energy that is destabilizing their grids and causing potential blackouts in their countries. [v] This action by German’s neighbors fragments the European electrical grid, turning Germany into an electrical island. Germany is planning to get 80 percent of its energy from renewable energy by 2050 and phase out its nuclear program by 2022. Despite significant investment in wind and solar power, Germany still faces an energy shortfall because the renewable energy it invested in does not work in the cold winter weather when the sun does not shine and the wind does not blow. Further, the shift to renewable energy is taking a toll on family budgets. [vi] Germany increased a special tax levied on consumers to finance subsidies for green energy by almost 50 percent this year, increasing electricity prices by 10 percent. There are also growing concerns that price increases are hurting businesses, although the German response has been to charge some consumers with much more of the burden than favored industries. The high use of renewable energy in eastern Germany driven by government green energy policies is causing instability to its own electric grid as well as to neighboring countries, resulting in industrial companies having to purchase generators and emergency back-up systems rather than face replacing equipment damaged during disruptions of service. Electricity bills are also expected to go up by 10 percent this year. With residential electricity prices in Germany already about 3 times higher than prices in the United States and increasing further, it is no wonder that 800,000 German households can’t afford their electricity bills. The German government recently cut its 2013 growth expectations to 0.4 percent from an earlier estimate of 1 percent. Germany was prospering in 2011 with growth at 3 percent, but it dropped to 0.7 percent in 2012. While the European economy as a whole and the switch to the Euro has affected Germany, one wonders how much the country’s energy program is contributing. Perhaps, the United States should use the German experience as a warning regarding the right choice of energy policy.